With seed prices on the rise, producers want the ability to monitor and control seed populations on the go. Electronic population rate control (EPRC), in base equipment on the 1590 Drill, allows producers to adjust the population rate right from the convenience of their tractor cab. 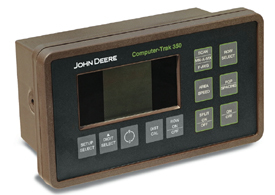 NOTE: To give producers the ability to monitor the population rate on the go, it is highly recommended they equip the unit with a ComputerTrak™ monitor or SeedStar™ population monitoring. NOTE: One system is used with 3.05-m (10-ft) and 4.6-m (15-ft) drills. The 6.1-m (20-ft) models require two systems. The versatile grain/fertilizer box with 19-mm (7.5-in.) row spacing can be set for 100 percent grain or 60 percent grain/40 percent fertilizer. The tube flexes to avoid crimping for consistent seed flow. It is made of non-corrosive nylon material for long life. Long tubes are 55.4 cm (21.8 in.) and short tubes are 10.8 cm (4.25 in.). The combination grain/fertilizer drill with 19-cm (7.5-in.) row spacing features a convoluted tube directing fertilizer from the discharge hole to the top of the steel seed tube at the seed boot. From there, a special Y-adapter lets seed and fertilizer mix before going into the furrow. ProSeries single-disk no-till openers are included in base equipment. The single-disk openers are mounted on one rank on the 38.1-cm (15-in.) row spacing single rank units and on two ranks on the 19-cm (7.5-in.) and 25.4-cm (10-in.) row-spacing units. 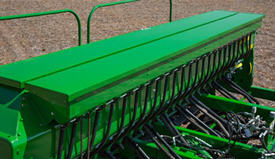 The single-disk openers provide consistent and accurate seed placement. 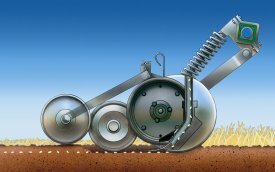 The active hydraulics work in conjunction with the opener spring to provide an adjustable range of 74.8 kg to 181.4 kg (165 lb to 400 lb) of down pressure per opener to penetrate hard soils and heavy residue. For additional ballast in hard-to-penetrate conditions, tractor suitcase weights may also be added to obtain maximum down pressure per opener. On the 3.05-m (10-ft) and 4.6-m (15-ft) machines, up to 10 weights can be added. On 6.1-m (20-ft) machines, up to 20 weights can be added (10 per side). The no-till openers work not only in no-till conditions, but also in clean-till conditions. There are 5.1 cm (2 in.) of free travel in the opener before spring down pressure takes over, allowing the opener to move over individual rocks and minimizing the chance of the gauge wheels bulldozing soil in soft or mellow conditions. Secondly, the opener spring will then travel a maximum of 20.3 cm (8 in.) up or 15.2 cm (6 in.) down before the hydraulics react to uneven seedbeds. Lastly, the cylinders will allow the openers to travel up or down an additional 40.6 cm (16 in.) with active hydraulic down pressure to follow the ground. The hydraulics will give the openers additional pressure when needed or allow the openers to go into relief if the pressure becomes too high. Drawbar support is required for regular hitches attaching directly to the tractor drawbar on 10- and 15-ft drills. Required for 10-ft drills when used with row-crop tractors (less than 150 horsepower) and 15-ft drills when used with all row-crop tractors. High-flotation tire bundles are used for wetter soil conditions and less compaction. The tongue fits between the horsehead of the dual caster hitch and the reversible hitch link. Dual castering wheel hitch provides additional support to the front of the drill, eliminating the need for a drawbar support on row-crop tractors. NOTE: Reversible hitch link is included and only compatible with a Category 3 drawbar on 8000 Series Tractors. The grass seed attachment mounts to the front of 1590 grain box and meters seed by fluted feed cups. Adjustable tube holder places the seed into the feed cup where the seed tube carries it to the seed boot. NOTE: For plain grain box, serial numbers N01560X680000 and above. For combination grain/fertilizer box, serial numbers N01560X685000 and above. The open-center hydraulic check valve is a pilot-operated check valve which traps oil to opener cylinders, maintaining preset position when tractor valve is neutralized. This check valve is required if drill is to be connected to tractors with open-center hydraulic system. It may also be used with closed center hydraulic systems. If the tractor valve is not neutralized on open-center tractors, damage to tractor will result (heat buildup in the hydraulic system). Kit includes: check valve, pilot line and necessary hydraulic fitting for installation. NOTE: This should be ordered when drills are rented or leased. The front-rank opener lockup kit provides a function to lock up the front rank. NOTE: Order N283209 grain feed stop and N215869 fertilizer feed stop as required from Parts. Regular drawn hitch provides increased weight transfer to tractor tires for reduced slippage, which is especially useful when operating on rolling ground. Includes safety chain. Semi-integral hitch with 2-point hookup to the tractor draft links or the Quik-Coupler. This hitch eliminates the need for a drawbar support.